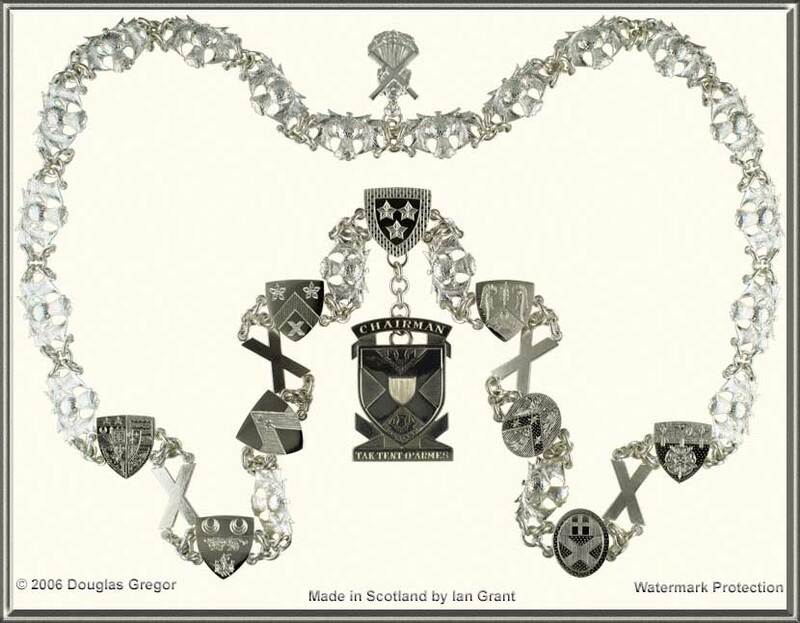 Centre top shield about 1¼ x1¼"
The chain displayed was made for the Heraldry Society of Scotland by Ian Grant (a founder member of the society). 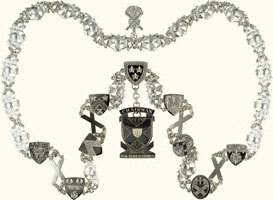 It displays the coat of arms of the society and of each chairman. 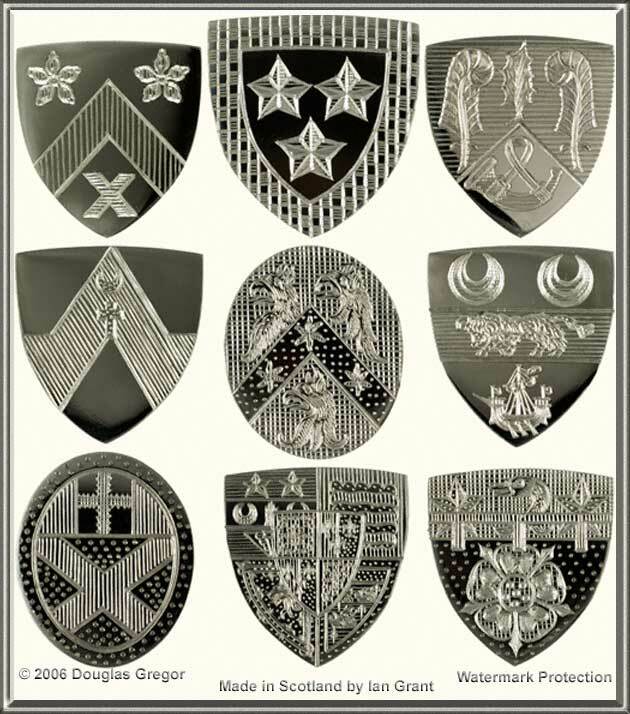 If you click on the links below below we display the blazon for each coat of arms so that you can check the hatching used to render the colours (explained and illustrated in our page about rendering colours). John MaldenPer fess Argent and Vert a pile reversed issuant from the fess line of the last and another issuant from the base of the first tipped with a long cross Or charged with a crescent of the third for difference. Kathleen CorySable, on a Chevron between Three Griffons' Heads Erased Or, Three Estoiles Gules. Patrick Barden, SBSt.J, BVSC, PhD, Dr.Med.Vet. FRCVS, FSAScotArgent,on a Fess between Two Crescents in Chief Azure and a Lymphad sails furled Sable, at the Masthead a Pennon Gules charged of the Arms of Scotland (Viz. Azure a Saltire Argent), at the Jackstaff the Banner of Scotland as above and at the Stern an Ensign Gules cantoned with the Arms of Scotland also as above in Base, a Highland Bull in his fury Passant Or, Horned, unguled and ringed Argent. Elizabeth Roads, MVOOr, a Saltire and on a Chief Gules a Pale Argent, a Cross Ingrailed Sable, all within a Bordure of The First. 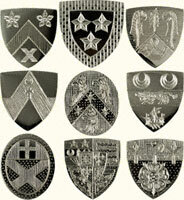 Peter Drummond-Murray of MastrickQuarterly : first, Azure on a fess between two mullets in chief and a pheon in base Argent a dexter hand between two crescents Gules (for Murray of Mastrick); Second, Or, three bars wavy, within a bordure engrailed Gules (for Drummond of Denham Fishery); third, Or, a lion's head erased, within a double tressure flory-counterflory Gules (as a coat of augmentation for the House of Drummond, Viscount of Strathallan); fourth, Azure semée of cross-crosslets fitchée Argent, three boars' heads couped Or, armed and langued Gules, a chief of the third, within a bordure Or (for Heaven of Ashfield); overall at the fess point an inescutcheon quarterly; first and fourth, Gules a cross saltire and orle of chains Or, with an annulet Gold stoned Vert in the fess point (for the Royal House of Navarre); second and third, parted per pale Gules and Or, three fleurs-de-lys, two and one, all counterchanged (for Ramirez de Arellano). Romilly Squire, DA, FRAScot, FRSA, SHA.Or a rose Sable seeded of the field on a chief of the second a swan's head and neck erased between two stars of the first overall a label of three points. Arms of the Heraldry Society of ScotlandAzure, on a Saltire Argent between Two Thistles Slipped Argent, One in Chief and One in Base, an Escutcheon Gules and in an Escrol under the same this motto " TAK TENT O' ARMES" (take note of arms).